Dark patterns are deliberate design decisions made to trick people into believing or doing something they might not have done otherwise. They’re so insidious that often times we don’t even realize we’ve fallen for one. It looks like you have to sign up for Dropbox to view and download the file, doesn’t it? That’s a very deliberate design choice on their part. 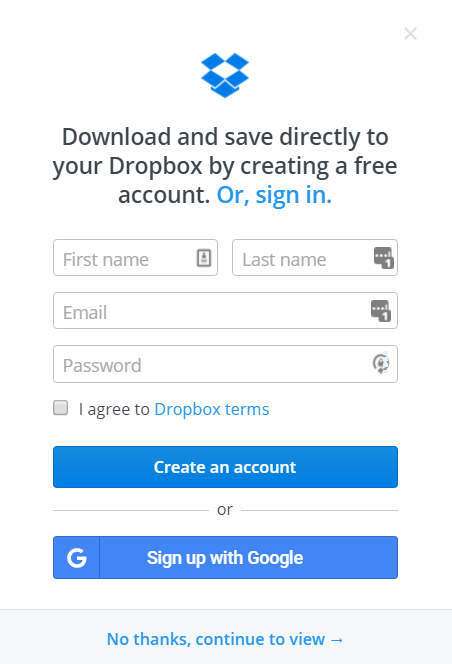 You actually don’t have to sign up to view the file – note the “no thanks” link hidden at the bottom – but Dropbox would much prefer that you sign up, so they bury that option instead of giving it equal weight. This post was prompted when I noticed Doritos pulling a similarly misleading stunt on their packaging – a bag with a big banner at the top that loudly advertises “25 more!“. We’re accustomed to seeing percentages in that context, but Doritos sneakily advertises that this bag is 25 grams bigger. Twenty-five grams! Needless to say, that isn’t a whole lot of chips, but it looks better on the bag than “7% more!”. Neither company here is outright lying, but it’s at best a pretty creative massaging of the truth. I much prefer playing it straight with people instead of trying to mislead them like this. Can it work? Sure. But is it the right thing to do?